Coating makers don’t want the sun to set on their pilot paint recycling initiative in the West, while the program is just rising in the East. The American Coatings Association has asked Oregon lawmakers to repeal the "sunset date" on the nation's first Architectural Paint Stewardship Program, PaintCare. ACA representatives testified March 14 and March 19 before the Oregon House Energy and Environment Committee in support of Senate Bill 791 and House Bill 2048. The American Coatings Association urged Oregon officials to make the 2010 pilot PaintCare program permanent. The program helps ensure the proper and effective management of post-consumer architectural paint, the industry group says. ACA’s PaintCare program in Oregon is a four-year pilot program that the association is seeking to make permanent and bring to other states. Oregon was the first to launch the program, but it is gaining steam nationwide. ACA, which represents paint and coating manufacturers, calls PaintCare a model for the "proper and effective management of post-consumer paint." Meanwhile, in Connecticut, program officials have submitted their PaintCare plan to the state’s Department of Energy and Environmental Protection. Connecticut plans to begin recycling paint under the program July 1. In its testimony in Oregon, the industry group highlighted the pilot program's successes. 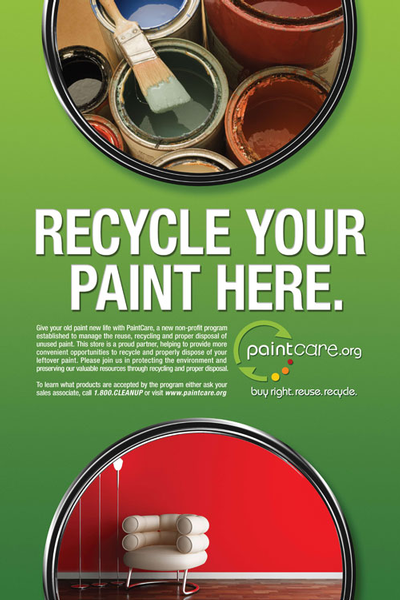 PaintCare posters appear at collection sites across Oregon. In its first two years, PaintCare established more than 100 collection sites for paint in Oregon, as opposed to the 15 sites it had pre-program, according to the ACA. Further, the program collected more than one million gallons of paint—recycling or beneficially reusing 100 percent of the paint collected, the ACA said. 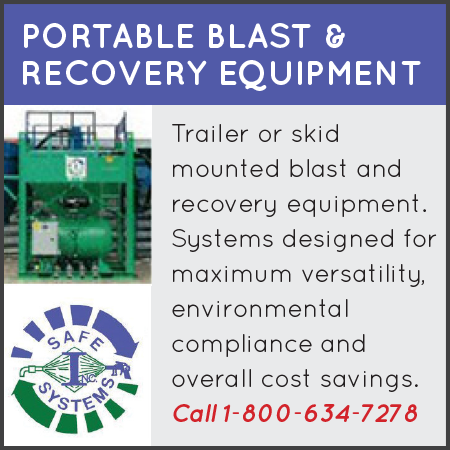 Moreover, 107 tons of plastic pails and 131 tons of metal cans have also been recycled through the program. Seventy-five percent of the collection sites in Oregon are in paint retail stores, which allow consumers and contractors to bring leftover paint back to the same places they buy it, seven days a week, during retail hours, ACA testified. Ninety-five percent of Oregon residents have a permanent collection location within a 15-mile radius. 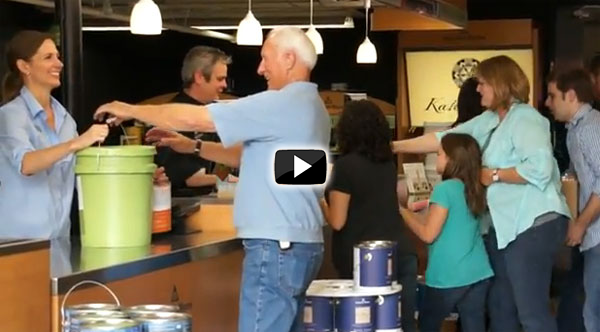 Where no permanent collection location exists, PaintCare has sponsored collection events. “For large-volume users, such as hospitals, universities, and large contractors, PaintCare has instituted direct pick-ups of leftover paint,” the industry group said. The ACA also noted that the PaintCare program was designed to relieve a considerable financial burden on local governments that previously shouldered the entire burden for post-consumer paint management. “Portland Metro, alone, reports its costs savings due to the PaintCare® program is in excess of $1 million annually,” ACA said. PaintCare Inc., the nonprofit organization created by ACA to administer the program, submitted its plan for a Connecticut PaintCare program to that state’s Department of Energy and Environmental Protection on March 1. The comprehensive plan, which covers the initiative’s operational organization, products, collection infrastructure, budget, and education and outreach, follows the 2011 statute (Public Act 11-24 1343) that mandated the paint stewardship program in the state. DEEP has two months to review and approve the plan, after which PaintCare has two months to implement its program, which is expected to launch on July 1, the ACA said. 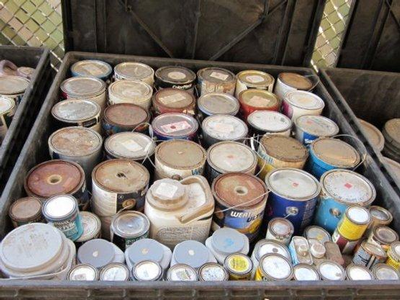 Program officials say they have identified some 450 paint retailers in Connecticut; 55 have expressed interest in becoming drop-off sites for the program. More retailers respond each week, the ACA said. PaintCare has also identified 56 temporary household hazardous waste (HHW) events; four permanent HHW collection facilities; and four waste transfer stations, and has started the process of partnering and contracting with the agencies that manage these programs, the ACA said. Since the start of the Oregon PaintCare pilot in 2010, ACA has passed permanent legislation instituting the same program in California, Connecticut, and Rhode Island. California operations started in 2012, and Connecticut and Rhode Island are set to begin this year.